2009: Ten years ago, I set out to visit all the churches of Suffolk, and managed it, on and off, over the next four years. Revisiting them all now, I have found changes, some for the worse but many for the better. At Mendlesham, there had been almost no change at all since my previous visit, which seemed entirely appropriate, and so I reproduce word-for-word what I wrote then. 2003: I often get asked which is my favourite Suffolk church. It is easy to make the case for Thornham Parva and Flowton, both of which are beautiful, and always open. Westhall and Denston are perhaps the most interesting, and it is hard to beat the special atmosphere of Kettlebaston and Blythburgh. For grandness, take me to Southwold or Eye, although there are those who swear by Lavenham, Long Melford and Clare, and for sheer magical presence Id argue for the haunting Ramsholt and Withersdale. As for architecture, or medieval survivals  well, it is probably best not to get me started. But there is one church that fits into pretty much all these categories, and it is here, not far from the main Ipswich to Norwich road. Not only is St Mary of Mendlesham architecturally and historically fascinating, it is also magical, grand, interesting, beautiful and open. What more could you want in a church? St Mary has a special place in the hearts of one particular strand of the Church of England; for here in this busy little working village among the barley plains is the last surviving thorough-going Anglo-Catholic parish church in all Suffolk. For well over a quarter of a century, Father Philip Gray has kept the flame of the Faith alive here. No Affirming Catholicism pussyfooting for Mendlesham. Here, Mass is still celebrated daily, the sacraments are administered, and the great Feast of the Assumption still kept as the highest Saints day of the year, as it once was all over Suffolk. I remember attending the Assumption Day Mass here in the mid-1990s. There were nearly as many Priests concelebrating as there were people in the congregation, but you had to count them quickly before they disappeared in clouds of incense. Nobody can swing a thurible as energetically as an Anglo-Catholic Priest, and Father Philip is more energetic than most. At the time, I was rather more used to the post-Vatican II simplicity of what Anglo-Catholics call the Roman Church, so to say that I was impressed is an understatement. As youve probably realised if you have travelled extensively around this site, I am utterly fascinated by the Anglo-Catholic movement. I think it quite the most interesting thing about the Church of England. What fascinates me most is the mindset of a movement that was born in the fire of the great 19th century sacramental revival, and is now the last remaining memory of that extraordinary epoch. It is as if, as Larkin says, it finds itself out on the end of an event, having survived it. It is easy to think of the Anglo-Catholic wing of the Anglican Church as a movement besieged. In its Forward in Faith incarnation in particular, it comes in for a great deal of stick, and rarely for theological reasons. It is accused of being misogynist, separatist, and authoritarian. The first of these is because it has not only declined to recognise the orders of ordained female ministers, but also refused to accept the authority of those who ordain them. Indeed, the FiF movement goes as far as to use the concept of taint to describe a male priest who has concelebrated with what are dismissively referred to as priestesses. In its defence, the FiF Anglo-Catholics argue that, if the Church of England is a true part of the One Holy Catholic and Apostolic Church, as they believe it to be, then a decision to ordain women cannot be taken in isolation from this worldwide Church  that is to say, the Catholic Church. Because of this, they argue that the ordination of women is actually invalid. Several Anglo-Catholics have told me that if the Pope in Rome started ordaining women, they would accept them with open arms at once, although this was obviously said in the safe knowledge that it isnt going to happen. The perceived separatism of the movement is a direct by-product of this position. FiF churches are effectively carving out a separate communion within the Anglican Church. By steadfastly defending their altars, accepting the authority of the so-called flying Bishops, and using the concept of taint to keep non-sympathetic male Priests at arms length, they have created a situation where, while accepting the authority of Canterbury, their congregations are no longer in communion with the rest of that church. While this situation appears untenable to many outsiders, FiF claims it has been done to safeguard the handing on of the Faith to future generations. It looks like they are settling in for a long siege. While I find myself more sympathetic to the Anglo-Catholics than to their accusers, I cant help but be reminded of Sellar and Yeatmans famous analysis of the English Civil War in 1066 and all that  that the Cavaliers were wrong, but romantic, while the Roundheads were right, but revolting. I think the Anglo-Catholics are the Cavaliers of the Church of England, although I fear that the dull-minded Roundheads will win in the end. But the liturgical character of the church will not be your first impression, or possibly even your second. The main thing that will strike you as you approach it is quite how big it is, and how ornate; an imposing presence, which is partly a result of it being placed flush to the road, where two street signs show that the road against the tower is called Church Street, and the one leading away from it Chapel Street. This must have seemed more symbolic in the 19th century than it does now, and I wondered if the 21st Century might more appropriately demand a DIY Superstore Street, or a Recovering From a Hangover Street, or even a Too Bloody Lazy To Get Up On A Sunday Morning Street. Like a modern Pilgrims Progress, perhaps. Next, theres the porches. Suffolk has some amazing late 15/early 16th century porches  Cautley thought Woolpits the best in England  so it is always a pleasure to come across one. Mendlesham has two. The ornate southern one is now blocked off as a chapel, so dont miss it  youll need to go right around the east end of the building to get to it. But the northern porch is the most remarkable. For a start, it is huge. It is crowned with quite the biggest grotesques in the county  even Bramford cant compete. Youll spot Suffolks finest woodwose; nothing symbolic about him, he looks ready to step down and belt you over the head with his club. If you are used to the ultramontane exotica of London's Anglo-Catholic citadels, it may surprise you to find that Mendlesham is, well, so very English. One of the charges levelled against Anglo-Catholic churches is that they are somehow foreign to English tradition  all those tacky continental statues, pictures of Mary, and even candles burning, are enough to turn the stomach of a thoroughgoing protestant Englishman. While the aesthetic qualities of some statues leave a lot to be desired (not at Mendlesham, I hasten to add) this charge is ridiculous. Before the Reformation, England was considered Our Ladys Dowry, the most faithfully Catholic country in Europe. The putting down of a sacramental life was a symptom of the Reformation as much as a cause of it. Theres nothing unpatriotic about the Hail Mary. The imposition of Protestantism was the most remarkable sleight of hand on the part of the Tudors, and one from which some parts of the British Isles are still suffering violent consequences. It is just my opinion, but I do not feel that the English are natural protestants. Each age constructs its own sense of Englishness, depending on who is in a position to impose it. For Anglicans, being the state church with the reigning monarch at its head has meant it has been continually buffeted by the winds of change. Even worse, there is the strain of the complex relationship between a spiritual kind of Englishness, which is much to be desired, and the more shady concept of Britishness and the Union. Why Anglican churches persist in displaying the Union flag instead of the English flag of St George is beyond me. I imagine it is a legacy of the First World War. At the time, the Church of England was in the most powerfully strong cultural position, and shamefully sanctified the slaughter. Several Vicars have told me how much theyd like to take the flags down. But they never do. So it was, on a Spring day in 2003, when our brave lads were away bringing death and destruction to a country of which we still appear to have learned nothing, I came to Mendlesham again. I am not an Anglican, but this church feels to me like a touchstone of what it means to be English, and to be a Suffolker, with a sense of a past, present and future. The church was open - it is always open. From the wide graveyard, an old lady passed me on her way into the church - as it turned out, to light a candle. This seemed to me such a beautiful, natural thing to do if you were visiting your dead family. I followed her into the porch. The upper part of the porch contains Mendleshams famous armoury, which can be visited by appointment. It is well worth the detour, and if you doubt the wisdom of having a weapons museum in a church, you might be relieved to learn that it is was quite common in the late Tudor and early Stuart periods for church porches and towers to host the Parish armoury. Some of the arms here date back to the 16th century, but more interesting perhaps is the Civil War stuff. Some of this was carried at the famous muster on Mellis Common which resulted in Suffolks only two Civil War deaths, when a musket went off by accident. Which just goes to show that friendly fire is nothing new. I mention the upper room of the porch before we go inside, because I want nothing to distract us from the impact of St Marys interior. A clue that we are about to leave the mundane world behind is in the porch itself; pressed into service as a holy water stoup is one of the loveliest fonts in the county. It came from Rishangles, when the church there was made redundant and sold off by the money-changers. It has had various claims made for its age, Mortlock unaccountably dating it as 1600; but it must surely be late 19th century. Whatever, it is stunning, and a mark that this church has always found a home for orphans of elsewhere, and that some of these orphans are beautiful. So, we step through into the devotional interior. If you were expecting a grimy gloom overlooked by kitschy statues, you are going to be disappointed. St Mary is full of light. And yet, from all corners there are glimpses of flickering candles, the gleam of icons and images. The church had a fairly early restoration, in 1860, at the hands of a major architect, Ewan Christian. You find yourself standing in a large space, much of the west end of the church devoted to the font, the organ, and some fascinating medieval benches. I spotted a cockerel and a wyvern, and a woman at a prayerdesk which might once have been part of an Annunciation scene. Among them are some slightly later benches, probably early 17th century, that came from Rishangles. The font cover is also 17th century, dated 1630, at the height of Laudian piety. It is nice to think that, given this church's modern tradition, it took a similar line back then. It was made locally, but contains Renaissance imagery rarely seen in this country; it would be quite at home at St Eustache in Paris. St Mary has two major brasses; but it didn't. The biggest is up at the east end of the nave (the placing of a nave altar turns this into a crossing) and is to John Knyvet. He died in 1417, and isn't far short of life-size. He's very typical of the period, in his armour, with the dragon head crest behind him. There's no inscription. There is one, however, on the other brass, which is mounted on the wall in the south aisle. This is the one that should really be at Southolt, and is to Margaret Armiger, a typical post-reformation sentiment of the 1580s. It really shouldn't be on the wall. If there was a fire, it would melt; floor-mounted brasses don't melt. It would be nice if it was still at Southolt, where the local people are extraordinarily caring about the little church. Unfortunately, at the time of its redundancy, the church was very badly vandalised, and we have Mendlesham to thank for rescuing this and other priceless art objects. Indeed, at Southolt it was actually mounted on a pew, fuel to the fire if there'd been one. I am sure that the nice people at Southolt today would do their best to look after it if they had it now, but it wouldn't have survived if it had been left there. Also from Southolt are the panels of medieval glass in the north aisle. They were angels and Apostles - you can easily spot fragments of St Andrew, St Bartholomew and St Thomas. The figure of St Thomas has been given the head of a lion. I loved this. 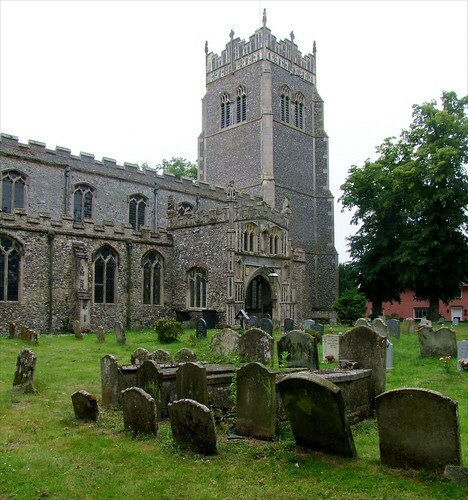 St Mary has more altars in use than any other church in Suffolk. There are five of them. I have already mentioned the nave altar, used for Mass. There is a very simple, typically rural high altar, dignified only by the big six candlesticks. At the east end of the south aisle is an extraordinary thing; an altar made of pieces of medieval mensas. A reliquary is set in the front. It is the only one of its kind in an Anglican church anywhere in Suffolk. The Stuart table imposed on the church by the prayer book liturgy has been turned into an altar in the north aisle. This is rather beautiful, with the image of the Mother of God in the central alcove above, and other Marian imagery. It was originally restored as a chapel as a memorial to the First World War. Finally, in the converted south porch, there is a Holy Cross chapel, dating from the 1970s. The wall paintings are quite, quite extraordinary. One of them is of St Helen finding the true cross. In another, as far as I can make out, a group of Celts are watching the raising of Lazarus. Above the chancel arch, a rather restrained rood group reminds us of the glory that once was pre-Reformation Suffolk. Up in the chancel itself, you'll find the shrine to Our Lady of Walsingham. Not on sale in the church, but generally available in Walsingham, is a lovely book by Father Philip, the Rector here, about the churches of Walsingham. I recommend it. There is also a place where you can light a candle for the work of Forward in Faith. If I have one criticism of this splendidly welcoming, interesting and devotional church, it is that there is no guide book. Over the course of the following week, I attended Mass in two Irish churches; one in South Armagh, the other on the Falls Road in Belfast. Neither was as ornate as St Mary of Mendlesham, neither was as filled with a sense of prayer and awe. I am sure that a time-traveller from the 15th century would have recognised Mendlesham as the real Catholic church, not the two Irish ones. Obviously, I believe theyd be wrong to think this, but I could understand it. So is Anglo-Catholicism anything more than a historical re-enactment? Are its churches merely liturgical museums? Is there life in the old movement yet? Come here, and look around. Everything is neat and clean, obviously much loved. This is not just a shrine; it is a living centre of its community. Here, the local people come for their baptisms, weddings and funerals; but they also come for private prayer, for the sacraments of Holy Mother Church as they understand them. As I said earlier, it always disturbs me seeing the Union Flag in a church; but there is something rather striking about seeing it draped beside an ikon of the Holy Mother of God. Also, there is something moving about a place that encourages candles to be lit, about corners that draw the eye and reveal unrealised paths to God. This is undoubtedly an English Parish Church of the 21st century; and yet, it has recaptured some of the mystery of its past, and is filled with a deep spirituality and sense of the numinous. For this alone, it is one of the most significant of all Suffolk churches, and one of my favourites.